Here we go folks... I'm developing some new weekly features with the help of someone much more creative than I am... so look forward to those in the future, but in the meantime - ask me anything you want. 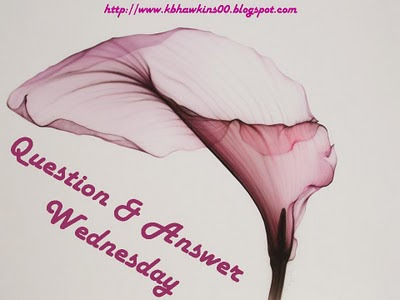 Question and Answer Wednesday is your chance to find out the answers to whatever you might want to know about me. I know that everyone found this little corner of the internet at different times and there might be holes in the story - so ask away. Even if you've been with me from the very beginning... you know that this blog has been about everything from marriage - weight loss surgery - friendship - infertility - spirituality - adoption - general life - and just about everything in between. So what do you want to know about little old me? Leave your questions in the comments section or email them to me directly... and I'll have the answers up by the end of the week. What music was playing in your car on your way to work today? If you could pick one song to be your "life song" what would it be? You know how I have my boy crush? Well, boy obsession really... anyway, who is your Ryan Reynolds? How does your Husband feel about it? If you could redo your living room, what would you change? if you could travel tomorrow to one place for a week, where would you go? What helps you to get to sleep at night? You recently dyed your hair red? Do you prefer that or blonde? Do your doggies do any tricks? How old were you when you had your first kiss? Like peck on the lips! MEOW. I love wearing colored tights. Today, I am wearing blue ones. I look like a very tall smurf! I think I love Smurfs. What would your Smurf Name be. Mine would be SILLY SMURF! If you could do anything today- free from any emotional, financial, physical, mental repercussions - what would you do? What physical things remind you of "home"? If you could only eat one fruit for the rest of your life, what would you choose? You said you wanted chips earlier. Did you get any? You make some lovely looking cupcakes. What recipes are you dying to try? Hi! It's your lurking friend Denee'! I have some lame questions for you! I know that you had weight loss surgery, and I'm going to my first infomation session tomorrow...do you have any regrets from having that surgery? Would you do it again? What has been the biggest adjustment since you had WLS? Thinking about you and praying for you every day! What would your dream "fantasy" job be? If you had to eat & drink only ONE thing for the rest of your life...what would they be? You would have to drink/eat the same thing EVERY DAY!